Former Alamo Police Chief Arturo “Art” Espinosa found his passion in law enforcement, working more than 40 years in the field before retiring Wednesday. Espinosa, 61, served as Alamo’s top cop for 21 years. He spent parts of his life confronting hardships head on and plans to be just as unwavering in his battle against prostate cancer. It wasn’t an easy decision for him to leave a career he relished, but he will spend time taking care of his health following the diagnosis late last year. He’s undergoing treatment that affects his strength and ability to speak. “I miss it already, but I got to slow down,” Espinosa said in a now soft-spoken voice affected by the medication. Though struggling to speak and walk, he has not lost his sense of humor, something his wife of 31 years noted. The two lifelong Alamo residents have two daughters who both work as sixth-grade English teachers. Espinosa enjoys talking about his daughters, who buy him and his brothers tickets to see the Dallas Cowboys for his birthday every year. The walls of his home are filled with the team’s memorabilia, photos of his family and law enforcement relics that include his badge and a letter he wrote when he applied for police chief. He began his career as a dispatcher with the Alamo Police Department in 1976 before moving on to a patrolman and climbing the ranks. Though he’s worked in Alamo for most of his law enforcement career, he spent about a decade with the San Juan Police Department, but he always cherished working and giving back to his hometown. “God willing someday I will be the chief of police for Alamo,” he wrote in his letter to the city before eventually heading the department. Espinosa often went above his regular duties, providing police escorts for funerals of those who could not afford the service. The path to keeping his position as police chief became a tough row to hoe when in 1998, less than two years after being appointed to the position, then-commissioners voted to demote him from chief to lieutenant. 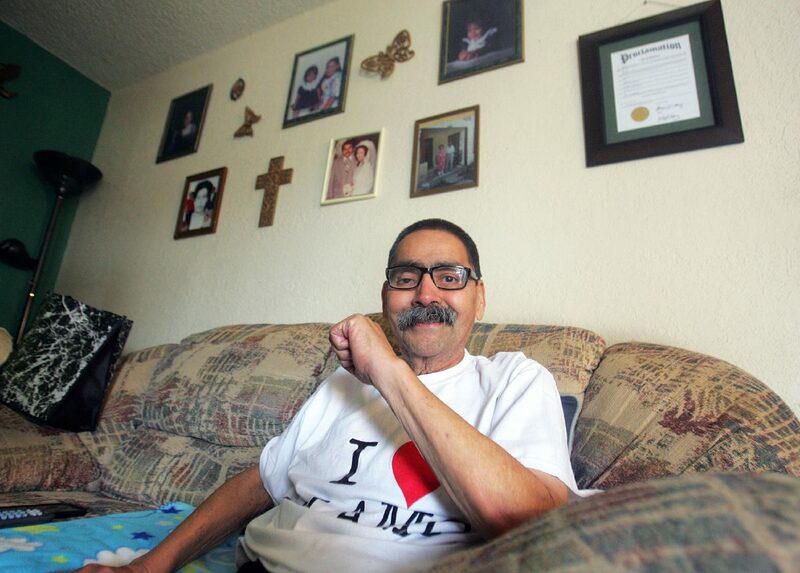 The following day, Espinosa fought to earn his job back and filed a complaint alleging the city had demoted him in part due to his disability. He has a prosthetic eye because of an accident he endured when he was 5 years old while playing pirates with one of his brothers. The move to demote him came a few months after an election, and he sued on grounds of violations of the Texas Whistleblowers Act, Texas Open Meetings Act, the right for due process and freedom of speech, political expression and political affiliation. A jury eventually awarded him damages in the lawsuit against the city, and required them to give him his job back without fear of retaliation. His first job, though, was not law enforcement, but instead he labored packing citrus and picking cotton in Alamo back in the 1970s. Now, he’ll focus on recovering from prostate cancer, but he eventually hopes to go back to some of his favorite pastimes — barbecuing with friends on the weekends, volunteering with Resurrection Catholic Church in Alamo and again rooting for the Dallas Cowboys next season. Espinosa will meet with doctors in the coming days and months, but visitors and encouragement from all over the state have kept him in good spirits. “I feel confident that I’m going to beat this thing,” he said.